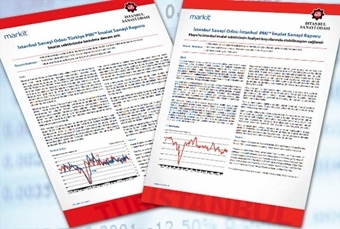 Istanbul Chamber of Industry announced the Turkey and Istanbul PMI (Purchasing Managers’ Index) Manufacturing survey results for May 2016. These surveys are recognized as fastest and reliable sources of reference for the manufacturing industry’s performance, which is a key indicator of economic growth. Accordingly, in May, Istanbul Chamber of Industry Turkey PMI Manufacturing index remained below the critical threshold of 50.0 for the third consecutive month, indicating the ongoing deterioration of the operating conditions of Turkish manufacturing industry through the second quarter in 2016. The PMI increased from 48.9 in April, which was the lowest read over the past seven months, to 49.4 in May, implying a moderate shrinkage. Four sub-indexes, except employment, adversely affected the PMI in May. Istanbul Chamber of Industry Istanbul PMI Manufacturing was 49.9 in May. The index remained slightly below the critical threshold of 50.0, indicating a certain level of stability in the operating conditions of Istanbul manufacturing industry. The PMI increased in comparison to the April’s reading of 48.9; however, it remained below the long-term average (since January 2006) of 50.6. The ongoing sharp fall in input stock adversely affected the PMI in May. Delivery time of manufacturers and suppliers did not change in comparison to April, while employment and new orders exhibited a modest recovery. “The survey in May revealed a good development as well: basic economic indicators, namely production, new orders and employment, are no longer in the negative. However, as manufacturing remained on the same level with the previous month’s, the increase in new orders was negligible. Weakened Turkish Lira continued to drive input prices up through May yet failed to revitalize exports, which decreased at the fastest pace over the past year.